When the imperial explorer James Cook returned from his first voyage to Australia, scandal writers mercilessly satirised the amorous exploits of his botanist Joseph Banks, whose trousers were reportedly stolen while he was inside the tent of Queen Oberea of Tahiti. Was the pursuit of scientific truth really what drove Enlightenment science? 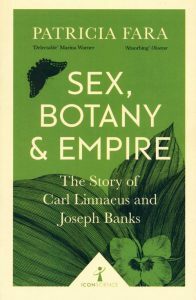 In Sweden and Britain, both imperial powers, Banks and Carl Linneaus ruled over their own small scientific empires, promoting botanical exploration to justify the exploitation of territories, peoples and natural resources. Regarding native peoples with disdain, these two scientific emperors portrayed the Arctic North and the Pacific Ocean as uncorrupted Edens, free from the shackles of Western sexual mores. In this ‘absorbing’ (Observer) book, Patricia Fara reveals the existence, barely concealed under Banks’ and Linnaeus’ camouflage of noble Enlightenment, of the altogether more seedy drives to conquer, subdue and deflower in the name of the British Imperial state. 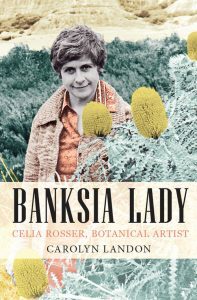 Presents the story of internationally acclaimed botanical illustrator, Celia Rosser, who dedicated her life to painting the entire genus of Banksia, the only artist to have done such a task. Her dedication to the task put her at the centre of the Monash Banksia Project underwritten by the University for twenty-five years and culminating in the production of an extraordinary three-volume florilegium that became one of the great books published in the twentieth century. This is also the story of the emergence of an artist, who grew up in difficult circumstances during the Great Depression, and pursued her art partly as a way of protecting herself from the harsher side of life. The narrative stays focussed on the path of the artist, as she grows up, develops her talent, and learns to understand and take advantage of it. The story follows her struggles to pursue her artistic passion while fulfilling the expectations of women in 1950s to subordinate themselves to their husbands as wives and mothers. As her children become more independent, she recognises opportunities and, eventually, finds a place at Monash University to fully express herself through her art. In telling this story of Celia Rosser’s unparalleled talent and extraordinary achievement, this book explores the history of Botanical Illustration, Botany, academia, gardens and their herbarium and Australia’s place in changing the shape of the world. Many of the most renowned and exciting ornamental plants such as magnolias, roses, rhododendrons, tree peonies, lilies, and blue poppies, have their origins in China. 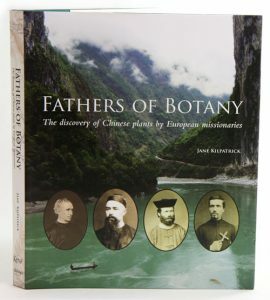 In the mid-nineteenth century, professional plant hunters were dispatched by nurseries and botanic gardens to collect living botanical specimens from China for cultivation in Europe, and it is these adventurers and nurserymen who are often credited with the explosive bloom of Chinese flowers in the West. But as Jane Kilpatrick shows in Fathers of Botany, the first Westerners to come upon and document this bounty were in fact cut from a different cloth: the clergy. My father in his suitcase: in search of E.J.H. Corner the relentless botanist. Edred John Henry Corner was one of the most colourful and productive biologists and mycologists of the 20th century. His career began in 1929 in Singapore, where he trained monkeys to collect specimens from the treetops of the rainforest, and published Wayside Trees of Malaya, a classic field guide interspersed with his delightful and idiosyncratic observations on plant life. He was key in the creation of Bukit Timah Nature Reserve, a 163- hectare plot that contains more tree species than the whole of North America. During the war, he considered it his responsibilty to safeguard the scientific and cultural collections of Singapore during the Japanese Occupation, but was branded by some as a collaborator. Post-war, after heading the ambitious UNESCO Hylean Amazon Project, he returned to Cambridge University and was appointed Professor of Tropical Botany in 1965.
e was elected a Fellow of The Royal Society, where he promoted the conservation of tropical forests and led expeditions to the British Solomon Islands and Mount Kinabalu. 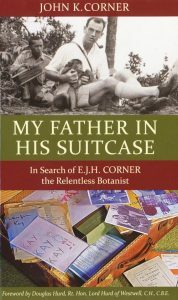 After 46 years, John Corner discovers his estranged father through letters, pictures and other memorabilia, resulting in an engaging and frank biography of an eminent scientist who put science above all, including his family. OUT OF PRINT. This is an extraordinary investigation into the world of trees – and the inspiring story of one man’s quest to help save the world’s oldest and greatest specimens. When the oldest trees in the world suddenly start dying – across North America, Europe and the Amazon – it’s time to pay attention. Humans have cut down the biggest and best trees and left the runts behind. What does that mean for the genetic fitness of our forests? No one knows for sure, for trees and forests are poorly understood on almost all levels. What we do know, however, suggests that what trees do is essential. When tree leaves decompose, they leach acids into the ocean that help fertilize plankton. When plankton thrive, so does the rest of the food chain. Trees are also nature’s water filters, capable of cleaning up the most toxic wastes, including explosives, solvents and organic wastes. They sequester carbon dioxide, act as nature’s heat shields, keeping cities 10 or more degrees cooler, and also release vast clouds of beneficial chemicals – some of which are anti-bacterial, anti-fungal and anti-viral. We need to learn much more about trees. But, meantime, we need to preserve them. 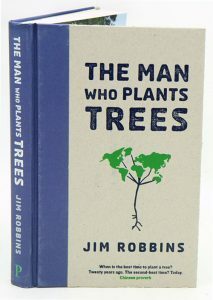 Jim Robbins’ book is a remarkable exploration of the power of trees and the story of a farmer named David Milarch, co-founder of the Champion Tree Project, who has been cloning some of the world’s oldest and largest trees to protect their genetics – from California redwoods to the oaks of Ireland. Raffles and the golden opportunity. Thomas Stamford Raffles (1781-1826) was the charismatic and persuasive founder of Singapore and Governor of Java. An English adventurer, disobedient employee of the East India Company, utopian imperialist, linguist, zoologist and civil servant, he carved an extraordinary (though brief) life for himself in South East Asia. The tropical, disease-ridden settings of his story are as dramatic as his own trajectory – an obscure young man with no advantages other than talent and obsessive drive, who changed history by establishing – without authority – on the wretchedly unpromising island of Singapore, a settlement which has become a world city. After a turbulent time in the East Indies, Raffles returned to the UK and turned to his other great interests – botany and zoology. He founded London Zoo in 1825, a year before his death. 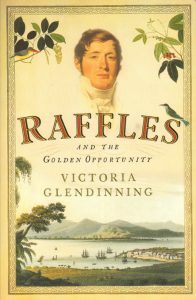 Raffles remains a controversial figure, and in the first biography for over forty years, Victoria Glendinning charts his prodigious rise within the social and historical contexts of his world. His domestic and personal life was vivid and shot through with tragedy. His own end was sad, though his fame immortal. 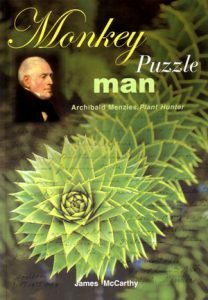 Monkey puzzle man: Archibald Menzies, plant hunter. Archibald Menzies was one of a legion of intrepid Scots plant collectors in the 18th and 19th centuries. This book recounts the story of how a young Scots gardener from humble origins became a distinguished plant pioneer who changed the face of gardens throughout Europe by his botanical discoveries. 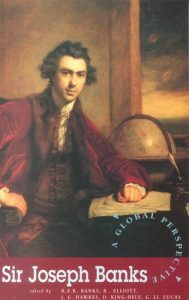 Sir Joseph Banks: a global perspective. Artist/Author: Banks, R. E. R. et al. Fourteen papers drawing together the many threads of Banks’s wide ranging interest and world-wide influence he had in the progress and development of science, technology, horticulture, agriculture, trade and politics.